Now that I’m finally current when it comes to Daredevil: Dark Nights reviews, it would be a shame to let the most recent issue wait too long. Here are some of my quick thoughts! With Daredevil: Dark Nights #5, David Lapham’s two-parter “What a Day, What a Night” (aka “A Man Named Buggit”) came to an end. It ended in the same anything-can-and-does-happen kind of spirit that our story began. Matt, as Daredevil, is chasing the tiny criminal Buggit across town in the middle of a monster invasion, all the while being sidetracked by various distractions. What I really like about this issue, and the story as a whole, is the fact that it doesn’t appear to follow any particular set of rules. It is deliberately convoluted and full of twists. Rather than draw a straight line separating good and evil, it seems to say: “it’s complicated.” The events of What a Day, What a Night are an interesting combination of serendipity and bad decisions, where serendipity itself gets the last word, and balances everything out by the end. 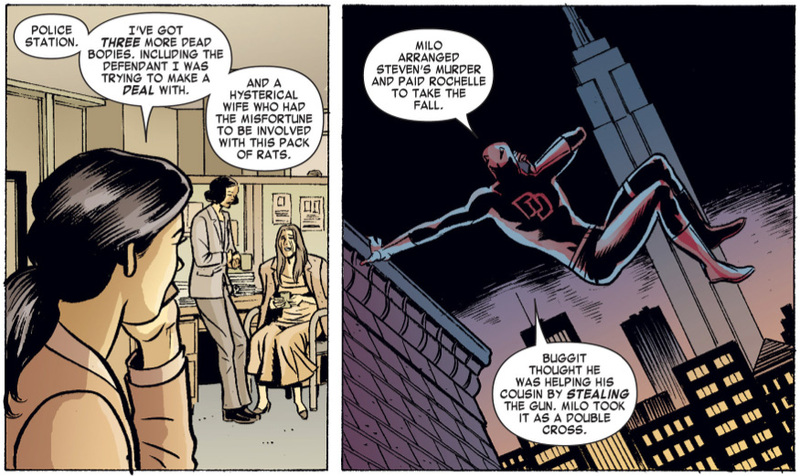 Throughout it all, Daredevil has his own set of decision to make. Life is rarely so simple that choosing the right thing to do is a matter of doing something, as opposed to doing nothing. While hunting down the increasingly distraught Buggit (who seems dead set on living up to his name), Matt has to decide whether to prioritize other things. He makes stops to help save a woman’s baby from a burning building – right in front of Spider-Man – and to finish cleaning up the mess created by the Shocker. Compared to Daredevil: Dark Nights #4, this issue has more of a tragic streak. However, it is still definitely a very funny hike across town. There is something just pitch perfect about how people just go about their usual business despite the fact that a gigantic monster just crawled out of the river. Considering that Marvel’s version of New York is the target of an intergalactic threat seemingly every month, this makes perfect sense, but you still have to admire Lapham’s decision to poke some gentle fun at the whole genre. Matt’s and Kirsten’s teasing back-and-forth throughout the issue is also bound to put a smile on your face. I really enjoyed both the writing and the art of this story, and I found the art to be even stronger this issue. It’s never over-worked and has a dynamic playfulness about it that I really like. And, despite the more fantastical elements of the story – the villains range from Godzilla-sized to ten inches tall – all the players look like they belong in this world. All in all, I found David Lapham’s two-parter to be thoroughly enjoyable diversion, and a great complement to the regular title. Next, we have a three-issue trip to Florida, courtesy of Jimmy Palmiotti and Thony Silas. I can’t wait! So far, this anthology series has more than delivered. We Daredevil fans should count ourselves lucky! I thought it was an enjoyable ending to this two-parter, from the rather no-nonsense way DD stopped Shocker (again!) to the ending, which I giggled over. Lapham subverts your expectations somewhat with the genre type of this story, but as you mentioned, I had little problem seeing DD thrust into this type of unusual situation. Looking forward to Florida and Misty Knight!